I have a facebook account but have no idea how to use it? Not a facebook user here. I had one and did a remove or whatever, but I still get email notifications from somebody I don't even know. Probably a friend of a friend of a friend that I do know. Not a facebook user here. Thanks anyway though. Mike. Look up IRV2 chatters...or send me an e mail with your name and I will try to hook you up.. I was expecting the forum to fulfill this roll, I really do not want to learn another computer "skill"
Just put a deposit on a custom Vintage Outlaw trailer (24 foot with lots of options and color to match the MH) to be used to haul the Jeep when traveling (not racing) I should have it for the trip for Florida in the spring to go watch the Gator Nationals in Gainesville. On another topic a friend of mine told me tonight that while traveling in Ohio they now have EZPass, and they weigh each axle when you go through. It turned out he was over weight on his rear axle (Renegade MH with Renegade Stacker Trailer) The gate came down and stopped him from proceeding. We got side tracked talking about the Gator Nationals and I forgot to get back to what happened after the gate came down. The weight pads must be pretty far in front of the toll booth and gate. For me, with a 32' RV, I am mostly through the toll booth lane before my car trailer makes it into the booth lane ... certainly far enough through to prevent a gate from coming down. I have heard of this before, the gates stopping the rig. 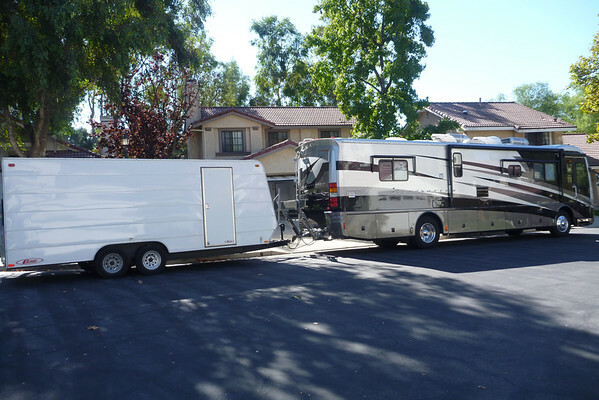 Most of the single rear axle motor homes and truck conversions (big white trucks) are overloading the rear suspension and tires to the point that they are legally overweight. This can result in a verbal scolding (go home and fix it), a fine or even being "taken out of service" which means you have to find someone to come get the trailer for you. The simplest and safest way to "keep the tongue weight of the trailer" off the coach of the Trailer Toad. The Trailer Toad carries the weight of the trailer and none is transferred to the coach. At toll booths you may have to pay for an extra axle but you are not overweight on the coach. Easiest way to prevent the issue; weigh the coach at a truck stop. Go inside tell them you need front axle and rear axle weights and trailer weight axles weight. )If you want to take a few minutes, ask them if you can unhook the trailer on the scale so just the tongue jack is sitting on the scale and get a 'tongue weight" reading. The truck camper in this photo had a 4' hitch extension and 1200 lbs tongue weight, with the Toad, no tongue weight and zero sway. The coach with the stacker is the Trailer Toad traveling display. 19,000 lb trailer with 2140 lbs tongue weight. The actual rear wheel weight went up on 48 pounds with the trailer attached, we weighed it one day at a Flying J CAT scale. 1995 34' Hawkins Motor Coach. Trailer Toad looks like it would be great for helping better distribute the axle weights. Just keep in mind that your coach has other weight limits such as Gross Combined Weight Rating, Maximum Hitch Weight, and Maximum Tongue Weight. I'm pretty sure the Cross Country pictured with a GCWR of 33,000 pounds is grossly over weight with the 19,000 pound stacker. How does that coach pull that stacker? What engine and coach weight? When we were contemplating a stacker before purchasing our 26' Haulmark Edge my biggest concern was not length, it was weight. I have the Cummins ISL and it moves the 36k pound coach around well and towed our 24' Wells Cargo trailer well but it only weighed around 8500 pounds loaded. I know how I am and with a stacker I am sure I would have all the toys loaded up and be in excess of 18k pounds especially starting with a trailer weighing around 9k empty. Currently our 26' Haulmark trailer weighs 10k with the sand toys and 12.5k with the Jeep and Harley and the coach still does well but I don't think I would be as happy with the coach with much more weight in tow. Currently I don't plan trips around mountain passes or grades like I did with our last coach and I love not having to be so selective on routes. They won't ~ at least in CA. If you are under 65', you're good! I got to talk with my friend again that had the gate go down on him. When the toll attendant came over he pointed out that it was an RV with RV plates, and the gate was lifted and he was allowed to pass without any further questions. Ohio has been weighing axles for some time now. However, it wasn't that long ago sometime this past summer that DOT has now changed the laws for the rear single axle maximum weight for motor-homes. It is now exempt from the national axle limit of 20,000 lbs. So Ohio will now have to allow motor-homes that exceed the single axle limit of 20,000 lbs. which mine does. I am currently at 23,378 lb's.